This text offers a review of basic and applied principles of dental materials and an update on current dental products, for predoctoral and graduate students, dental practitioners, dental hygienists, and dental technicians. In keeping with the previous edition, this fourth edition stresses basic principles and limits coverage of historic techniques and materials. There is updated material on color and appearance, surface phenomena and adhesion to tooth structure, polymeric restorative materials, dental amalgams, dental porcelains, orthodontic wire, and implant and bone augmentation materials. Numerous B&w clinical photos and photos of equipment are included, along with B&w microimages. Learning features include chapter glossaries and discussion and study questions. O’Brien is director of the Dental Materials Laboratory at the School of Dentistry, University of Michigan. 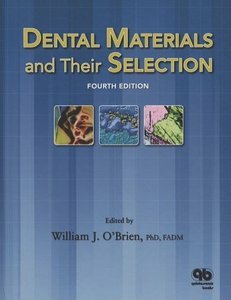 how to download the book dental materials & their selection 4th edition by William J.O’Brien.